LaRie Ann Belcher-Hancock, 71, passed away on Thursday, September 7, 2017, at a local medical facility. A funeral service will be held on Monday, September 11, 2017, at 1:00PM in the sanctuary at Lawn Baptist Church, Mark Moore officiating, directed by Fry~Smith Funeral Home, Tuscola. A visitation will be held on Sunday, September 10, 2017 from 5:00PM to 7:00PM at the funeral Home in Tuscola. LaRie was born in Baird on January 15, 1946, she was one of four children born to Dave and Maxine (Freeman) Poindexter. 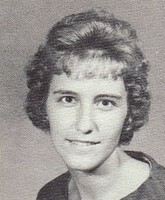 She attended Jim Ned schools and graduated in 1964. She attended business school and upon graduating started her banking career. She retired from First State Bank in Tuscola after 30 years of service. LaRie was a member of Lawn Baptist Church where she shared her love of the Lord. She taught Sunday school for 20 years. She was known as a great cook who loved to bake and share her baking at family dinners. Through the years, she was always a great sister to her two brothers Don and Dewayne, and her sister Brenda. She is survived by her husband Buck Hancock of Goldsboro; sons, Ricky Belcher of Lawn, and Bobby Belcher of Lawn; brother, Don Poindexter and wife Becky of Abilene, stepdaughter; Melissa McCoy and husband Steve of Temple, stepson, John Hancock and wife Samantha of Moody, and ten grandchildren. She is preceded by her parents, brother, Dewayne Poindexter, sister, Brenda Poindexter.